Charles Blair Macdonald is universally considered one of the finest golf architects ever. His portfolio, however, is one of if not the smallest of the masters who worked during the Golden Age of golf design, 1910 to 1939. Macdonald’s work encompasses approximately 12 solo works plus another three projects on which he consulted. One course credited to his protégé Seth J. Raynor, Morris County Club in Morristown, N.J., appears to be the work of Macdonald. The most sound pieces of evidence linking Macdonald to the design are letters and newspaper articles. The letters were written t0 noted golf turf specialist C.V. Piper by Wynant Vanderpool, an important Morris County member who was intimately involved with the building of the course and was a former president and executive director of the USGA. MCC was an prominent club early in the history of American golf. It hosted the 1898 U.S. Amateur won by Findlay Douglas. Macdonald, the 1895 champion, played in the event losing in the semifinals. The 1896 and 1905 U.S. Women’s Amateur were also contested at MCC. In 1918, Morris County’s new course opened, two years after construction commenced. It was built partially on the same site as the previous layout but additional land was purchased for the upgrade. Almost as soon as the course was playable, however, there were significant turf problems, namely an infestation of grubs, which was the reason Vanderpool contacted Piper. The mentioning of Raynor in no way detracts from the hypothesis that it is a a Macdonald design. If it was a Macdonald course, Raynor would have been construction superintendent as he was on every Macdonald creation after the building of the National Golf Links of America where Macdonald initially hired Raynor to survey the property. Vanderpool sent a second letter to Piper four days later. There is no mention of Raynor. On Jan. 15 of 1919 Vanderpool wrote Piper again and again only Macdonald was discussed. Charles Blair Macdonald in 1913. Just over two years later a New York Herald Tribune newspaper story from Dec. 12, 1918 chronicled the agronomic problems the club faced. The story details how new course opened with 16 usable holes, but in a short time the insects destroyed six putting greens and a number of fairways. It is not just historical evidence, however, that indicates Morris County is Macdonald’s work. Architect Ron Forse’s firm completed an extensive restoration of Morris County that wrapped up in 2016. Forse does not see the hand of Raynor in the design but can easily spot plenty of Macdonald features. Forse’s restoration was in large part based on an undated aerial of the course that is believed to date back to the late 1930s or early 1940s. Among the clues that Forse says makes him believe MCC is the work of Macdonald is the bunker style and placement which are common to Macdonald’s work but rarely found on Raynor’s. According to Forse the sand hazards are “more in tune to Mid-Ocean (Club) in Bermuda,” a Macdonald layout built by Raynor. The “pearl necklace” bunkering motif, a series of small sand hazards positioned in a line closely to each other, is found frequently on Macdonald designs and rarely on Raynor layouts. The six bunkers on the par-3 13th at Morris County is a perfect example. The entire green complex, with a putting surface that falls diagonally away from the line of play but is not a Redan resembles closely the first hole at Gibson Island Club in Maryland, a Macdonald course built by Raynor, which opened in 1924. Forse also referenced the seventh hole at MCC, an uphill par-4 of 320 yards that ends at a green surrounded by seven small bunkers, something that would unlikely to be found on a Raynor golf course. Raynor almost always left open the front of greens on par-4s and par-5s, and if he did place a bunker in front, as with his use of an occasional Lion’s Mouth feature, there were still routes by which a shot could be run onto the green. At MCC, the only way to get to the putting surface of the seventh is through the air. 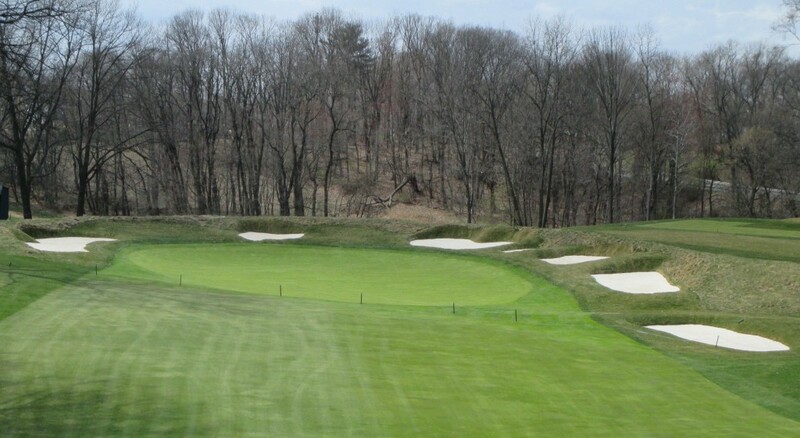 The Morris County greens, according to Forse, are another reason he believes it is a Macdonald course. “There is a lot more internal and subtle contouring than on Raynor greens,” he said. At Morris County, except for the left side of the 17th, an Eden Hole, missing are the large greenside bunkers placed well below elevated, manufactured putting surfaces that is as trademark of Raynor. Even on 17 the apparently original bunkering doesn’t quite fit the Raynor style. A 1922 photo of the green, which appeared in a grass seed advertisement, shows a hazard that is much thinner than what would be expected of Raynor. Not everyone, however, is swayed by the arguments. Morris County member and historian Peter Eld believes MCC is a Raynor design and Macdonald acted as consultant. 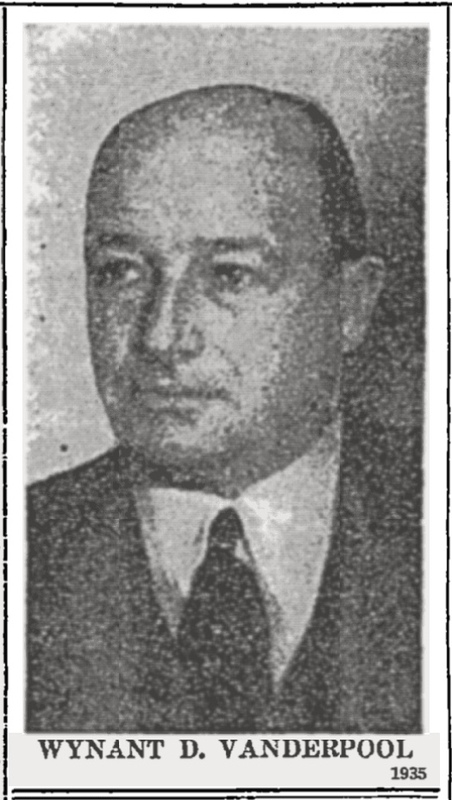 In 1916 when construction on the new Morris County course began, Raynor was a busy man with projects that would have taken him way from Morristown. Opening that summer was the Blind Brook Club in Purchase, N.Y. He mostly designed the course, although the club would not implement fairway bunkers for another year or so and would do it without any input from Raynor. In 1916 and ’17 work was also underway on Raynor’s Mountain Lake Club in Florida. Raynor was also waiting for construction to start on Shoreacres Club in Lake Bluff, Ill., and Country Club of Fairfield, in Connecticut. The projects were delayed by the First World War. Macdonald also had projects going at that time. MCC has records of payments to Raynor by the club but none for Macdonald. That, however, is not surprising, Macdonald never took money for his course design work. Whether or not Morris County is a Macdonald or a Raynor, the fact remains it is a challenging and thoughtful layout that a hundred years after it opened is still entertaining golfers. Anthony Pioppi is the author of "The Finest Nines, North America's Best Nine-Hole Golf Courses, “To the Nines,” “The History of The Minikahda Club Golf Course,” "Shoreacres, The First 100 Years, 1916-2016" and coauthor of “Haunted Golf.” Host of the Renovation Report podcast on Turfnet.com, Pioppi written for publications including the USGA website, Golf Course Architecture, Superintendent magazine, Links, GolfPunk, the Chicago Tribune and Golfweek. The Executive Director of the Seth Raynor Society, Pioppi is an overseas member of the St. Andrews Golf Club, Scotland.